Home-based care is much more than babysitting. It’s extremely hard work, and the people, mostly women, who take it on are notoriously underpaid. DETROIT—Lorna Parks’ workday officially begins at 7:30 a.m., when six infants and toddlers start to arrive at her two-story Detroit row house for the day. But often she’s up as early as 2:30 a.m. to get ready, including a recent project converting a room into a new nap center. During a typical day, Parks changes around 30 diapers—and that’s when the children in her care don’t have the runs, as was the case one week this past September. Parks, 49, is on her feet for more than 10 hours, leading group singalongs, preparing meals, scooping crying toddlers into her arms, and taking an occasional “break” to sit pretzel-style on the carpet with the kids. When they finally leave at 5 p.m., and she’s handed parents their “daily experience sheets” with complete records of when and what children ate, new scratches or bruises, and any new or odd behaviors, Parks begins the evening ritual of sanitizing sheets and cots. If she doesn’t have too much schoolwork from her five-hours-a-week classes at a nearby college, including one in the foundations of early childhood education, she’ll settle in for a little aromatherapy before bed at 10:30 p.m.
“Because those who provide this service are primarily women, many of color … the work is devalued and therefore compensated poorly,” said Marcy Whitebook, co-director of the Center for the Study of Child Care Employment. It’s not just the financial well-being of child care workers and directors that’s at stake. Home-based operators help teach about 1.5 million kids a year how to speak, process language, exhibit empathy, develop curiosity about the world, and so much more, playing a big role in how the youngsters fare in their kindergarten classrooms and beyond. And research shows achievement gaps in math and English along racial and socio-economic lines have often already hardened by the time kids reach kindergarten. On a recent afternoon, Parks sat cross-legged on a beige carpet, watching 15-month-old Nylah pull apart a homemade toy: a ball of red yarn. Parks knew the ball wouldn’t last long when she made it, but she’s committed to building as many toys as she can by hand. It’s one way she’s found over the years to save a few extra dollars. Two other toddlers finished up an afternoon nap, and an older child scribbled in a diary. Parks sat under a wall adorned with photos and heirlooms marking Detroit’s black history and tracing her family’s lineage all the way back to slavery. It’s the biggest room in her home and the one where her students nap, read, and do daily music lessons. When she opened her program in 1999 at the age of 31, Parks knew it was a financial risk, but she had another motivation: She wanted quality child care for her own newborn daughter, Joy. Parks had been caring for children in one setting or another since she was 9 years old and closely observed her mother, a Detroit Public Schools special education teacher. After graduating high school, she began working at a child care center for teen mothers. She eventually took a monthslong course in the Montessori method of child care, which emphasizes play and exploration, but had to quit and temporarily take a factory job to pay her son’s tuition and put down a payment on a new house. By the time her daughter, Joy, was born, Parks was stable enough to start her own program, which she figured would allow her to care for her daughter while also providing a service to the neighborhood. That kind of sacrificial attitude is common among the most devoted home-based providers. But limited funds make it hard for them to build high-quality programs, since they often can’t afford to hire support staff and have to turn down time-consuming or pricey training opportunities. Parks relies on three main sources of revenue to support her business: tuition payments from families, state subsidies that cover families at or below 130 percent of the national poverty line (all of Parks’ students), and monthly stipends from a partnership with the federal Early Head Start program. But in most states, including Michigan, state subsidies don’t cover the full amount of tuition— $160 a week for Parks, an amount she says is low compared with programs of similar quality. The subsidy amounts are usually set at a percentage of market rate for child care in the county where that program operates. That means the subsidies in Detroit’s Wayne County, for example, are lower than the ones for wealthier suburban Oakland County next door, where day care centers charge families more. Parks gets a little more than $4 in subsidies every hour each child is in attendance at the program. If they come the full 40 hours a week, then she recoups her full tuition, but she said that’s rarely the case. She’s allowed to charge the families the balance, but she often lets financially struggling families off the hook. In a typical year, Parks estimates that she grosses about $45,000, but it quickly disappears on supplies and food for the program, upkeep of her house, and training courses. She’s happy just to pay her bills at the end of each month, she says. She relies instead on volunteer help from her now-grown daughter, Joy, and a friend. That means some days find her alone trying to meet the needs of kids ranging from infancy to 8. If she had a full-time second employee, Parks said, she could at least split the older kids from the younger ones and spend more one-on-one time with the younger ones. 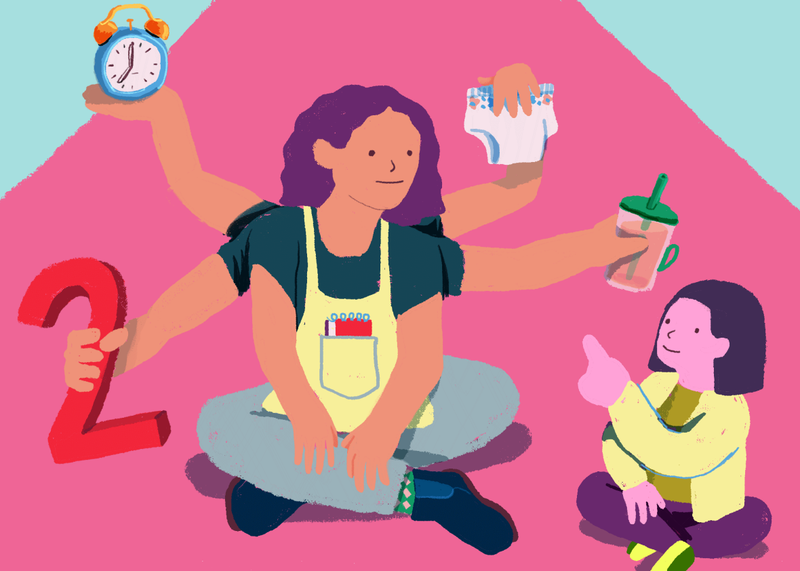 Though little exact data exists on how many 2-year-olds attend home-based child care programs, they represent a kind of sweet spot for providers like Parks. They’re too young to attend preschool and therefore have fewer options than their older peers. They’re also less expensive to care for than infants because they require less one-on-one time. Celeste Holmes-Collins said she felt more at ease sending her daughter, Maikko, who’s 2, to a home than to a center. “I wouldn’t trust anyone more than Lorna to take care of my child,” she said. There’s a risk, though, that 2-year-olds might slip through the cracks in programs with multiage groupings. They don’t require the involved hands-on time of an infant, yet they are typically not nearly as verbal as 3- and 4-year-olds, making them easier to overlook. The lesson was supposed to be about watermelon, but another fruit stole the show. Parks likes to expose the kids to new foods, and on this day her idea was to ask 2-year-old Maikko, 1-year-olds Nylah and Terrance, and 8-year-old Jade to compare the taste of yellow and red watermelon. But Maikko, the group’s pickiest eater, had her eye fixed on a plum on Parks’ counter. Without missing a beat, Parks picked up the plum and slowly enunciated the fruit’s name before handing it over to Maikko, who watched raptly. “The plum is a fruit, it’s round, and it’s smooth,” Parks told the entranced Maikko. These are the kind of impromptu vocabulary lessons that Parks teaches dozens of times each day, capitalizing on something that a child seems naturally interested in, repeating the word as many times as possible, and connecting it to other important words. Knowing how to utilize everyday activities to teach young children words, life skills, and more is crucial but not always intuitive. That’s what makes the dearth of quality training for home-based providers so concerning. “Teacher effectiveness is one of the huge gaps in this field,” said Denise Smith, the former trainer who left Detroit to lead a child care initiative in Flint, adding that one area where home-based providers consistently struggle is how to interact with children in an educationally enriching way. Across the country, training for home-based providers is spotty. Most, like Parks, don’t have degrees in early childhood education—or college diplomas at all for that matter. And most states require rudimentary training, focused mostly on health and safety codes, to grant a license to a home-based operator. And then there’s the question of quality. Many existing training programs don’t provide particularly practical advice, said Smith. Take Parks’ thoughtful approach to shoring up 2-year-old Maikko’s verbal skills. When Parks reads aloud to Maikko, she stops often to point to pictures, say the corresponding word, and wait to have Maikko identify the word on her own. She avoids tools like flashcards that make kids feel like they are being tested. Parks attends the annual required state trainings, which she says are relatively repetitive and unhelpful. But she’s also been creative and found several opportunities on her own, including a grant that covers 80 percent of her tuition cost as she works toward an associate’s degree in early childhood education at nearby Schoolcraft College. There have been some positive changes in recent years. One is the proliferation of state-funded, voluntary quality rating and improvement systems across the country that give child care operators access to more training and financial incentives if they agree to be regularly evaluated by a state agency and allow the results to be published online. Parks said the program—called Great Start in Michigan—has been “wonderful” and that she’s received training in children’s social and emotional learning and gotten opportunities to network. But many providers, especially those without state licenses, still haven’t signed up. Smith estimates that only 50 percent of home-based providers participate in Michigan. In many instances, the women who most need the extra guidance are the least likely to receive it. So what can be done about the situation? One solution is to work to bring more unlicensed home-based providers under programs like Michigan’s Great Start so that they can be better monitored and supported. An estimated 900,000 women across the country still operate “unlisted” programs that aren’t licensed by any state agency. Many don’t think the benefits would outweigh the challenge of having to comply with state standards, said Smith. Although the training and funding situation isn’t ideal for Parks, licensure does come with some supports, like the additional training and higher reimbursement rates she can access through the Great Start program. Another solution: power in numbers. For instance, there’s the approach that Smith tried for a time to spearhead in Detroit—forming a network of home-based providers who work in the same neighborhood to share professional advice, fundraise, set up a common food pantry to help out their students’ families, and receive individualized coaching from a coordinator like her. The idea would be easily transferable to cities across the country with high concentrations of home providers who too often feel like they work in total isolation. When the network was operational, Smith encouraged the providers to learn more about fair pricing and not undercharge for their services. She tried to make sure the providers weren’t inadvertently further depressing the market rate for child care in the city, which in turn would lower the subsidy amounts the state provides eligible Detroit families. But when the grant funding ran out, and Smith had to leave, none of the individual providers had the bandwidth to take on the administrative work of keeping the network going. It’s a common ending to a promising approach, said Whitebook. She described early childhood education as a “graveyard” of promising, grant-funded ideas. Of course, one of the most obvious solutions is more money. While the federal child care block grant that funds the state subsidies remains the primary source of funding for home-based providers, states like Minnesota have begun investigating other ways to get money to providers like Parks, including providing state-funded workforce development grants. Ultimately, without more money, early childhood education will not “deliver on its promise of giving all children an equitable chance,” Whitebook said. And mustering the political will to spend more on child care is a slow and messy process that requires convincing policymakers of the value of the work. Many women who operate home-based programs currently face a chicken-egg dilemma: To get more money, they have to demonstrate their worth; but to offer quality programs requires more money. Part of the solution may be to find ways to research and highlight the benefits of well-funded, quality programs on school readiness performance in the early elementary years. But a key first step is to think—and talk—of providers like Parks less as babysitters and more as children’s first, and arguably most important, teachers outside of their own homes.